If you own a well-fitting pair of skinny or straight-leg jeans, you can turn them into bootcut jeans. Unlike bell-bottoms, bootcut jeans begin to flare out from lower on the leg. All you need to turn your jeans into a bootcut style is a little fabric and some basic sewing skills. Try on your jeans and decide where you want the flare to begin. Most bootcut styles begin to flare at the mid-calf (where a pair of boots would hit, hence the style's name). 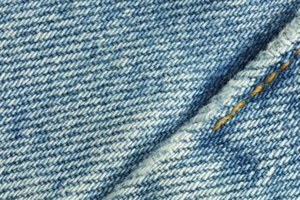 Use a sewing pencil to mark the location where you want the flare to start on your jeans. Don't worry about this mark showing; marks from sewing pencils are designed to come clean in the wash.
Rip the exterior seams of your jeans using a seam ripper. Only rip the seams up to the point you marked previously. Decide how much you want your jeans to flare. This will determine how big a piece of fabric you will cut . Bootcut jeans are characterized by a modest flare, as opposed to bell-bottoms. Cut out two identically shaped triangles from a piece of fabric. While you can use any fabric, choosing a fabric that has a pattern or wash similar to your jeans will camouflage your work a little better. The triangle should be an isosceles, meaning it will have two sides of the same length and one side that is a different length. The sides that are the same should be the identical length as your now-exposed seam, the seam you just ripped. The one side that is a different length will determine how much of a flare your bootcut jeans will have; 2 to 3 inches will create a subtle bootcut instead of a wide flare. Leave a half-inch on each side of the triangle as a seam allowance. Turn the jeans inside out. Use pins to secure the triangle-shaped fabric to the jeans. Remember the seam allowance you created. That's the amount of fabric you'll have to create the seam. You'll want to attach that half-inch of extra fabric to roughly half an inch of the jeans; this will ensure your stitching is minimally visible from the outside of the pants. Thread a needle (or a sewing machine if you don't want to do this by hand) with a thread color that matches your jeans, such as a dark or navy blue. Sew along the edge of the two seams created in step 6. Try to sew in as straight a line as possible. This is easier to do with a sewing machine than by hand. Once you have finished sewing together the jeans and the extra fabric, tie a knot in the thread or go over the end of the seam a second time if you're using a sewing machine. Turn the pants right-side out. Examine your stitches. If they aren't straight, or your stitches were too large, rip out the seams and repeat the process again, paying closer attention to your sewing. Make sure the two triangles you create are identical. If they aren't, your pant legs will have flares of different dimensions. If you choose to sew by hand, consider using a thimble to protect your fingers from the needle.